The National Hurricane Center says Subtropical Storm Alberto has come ashore on the Florida Panhandle. The Miami-based center said in a 5 p.m. EDT advisory that Alberto's core made landfall Monday at Laguna Beach, Florida, about 15 miles (20 kilometers) west-northwest of Panama City. Subtropical Storm Alberto rumbled inland Monday after its Memorial Day strike on the U.S. Gulf Coast, driving holiday weekend beachgoers away as heavy rains began pelting wide areas of the Southeast amid a rising flood threat. 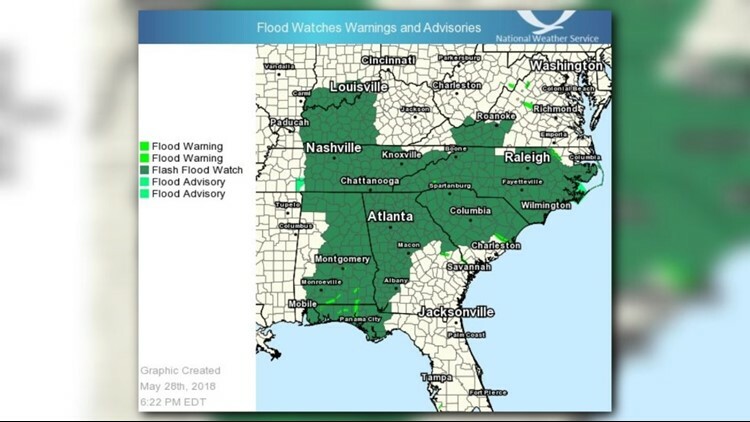 Forecasters warned that downpours from the vast system of swirling storm bands now raise the danger of flash flooding across several Southern states in coming hours and days. Alberto's ragged core made landfall near Laguna Beach in the Florida Panhandle on Monday afternoon before it began crawling inland. The National Hurricane Center in Miami said Alberto was centered at about 7 p.m. Monday near the community of DeFuniak Springs in the Florida Panhandle. With maximum sustained winds of 40 mph (65 kph), Alberto had begun weakening as it moved to the north at 10 mph (17 kph). Between four and eight inches (10-25 centimeters) of rain could pummel Florida Panhandle, eastern and central Alabama, and western Georgia before the storm moves on. Isolated deluges of 12 inches (30 centimeters) also were possible. Forecasters said Alberto could become a subtropical depression in coming hours as it treks northward. The system is then expected to spread rains over the Tennessee Valley on Tuesday and push later in the week into the Ohio Valley and Great Lakes region. Rough conditions were still whipping up big waves off the eastern and northern Gulf Coast by nightfall Monday. Authorities spent the day warning swimmers to keep out of the surf because of life-threatening swells and rip currents. As Alberto's center heads inland it is being deprived of the warm waters that fuel tropical weather systems, causing it to weaken, forecasters say. A subtropical storm like Alberto has a less defined and cooler center than a tropical storm, and its strongest winds are found farther from its center. Meanwhile, the storm forced some Memorial Day tributes to be cancelled across Florida's Panhandle. Safety was the priority, but the decision was still a "heartbreaker," said Tom Rice, a 29-year-old Army veteran who leads the organizations that planned a ceremony Monday at Beal Memorial Cemetery in Fort Walton Beach. Some stragglers still made their way through the rain to pay tribute at the cemetery's Veterans Tribute Tower, however. Rice said American flags had been placed Saturday on the graves of all 1,700 veterans buried in the cemetery. Along the Florida Panhandle coast known for its pristine beaches, tourists vowed Alberto wouldn't dampen their vacations. Jason Powell sought to keep his children entertained with movies and TV until Alberto blows past his Florida vacation spot. "So far we've seen a lot of wind and the ocean is really high, covering up the entire beach," Powell said. "We're not letting it ruin our vacation." Janet Rhumes said her group of friends from Kansas had been planning their Memorial Day weekend on Navarre Beach since October. They stocked up on groceries and settled in for card games. "We've never seen one before and we're here celebrating a friend's 20th birthday," Rhumes told the Daily News. "So how often can you say you rode a storm out?" Alberto, the first named storm of 2018, got an early jump on the Atlantic hurricane season. The National Oceanic and Atmospheric Administration released the annual hurricane season forecast Thursday in which they call for 10 to 16 named storms, with five to nine hurricanes. One to four hurricanes could be "major" with sustained winds of at least 111 mph (178 kph). Kay reported from Miami Beach, Florida. Associated Press writer Kate Brumback in Atlanta contributed to this story.